More great white sharks have been spotted in Santa Cruz this week. The beaches in the area were packed Wednesday despite marine biologists seeing more sharks just off the shore. "We saw a few white sharks, probably 10 sharks," said David Ebert with the Pacific Shark Research Center. "They were mostly five to eight feet, and a couple were 10 to 12 feet." 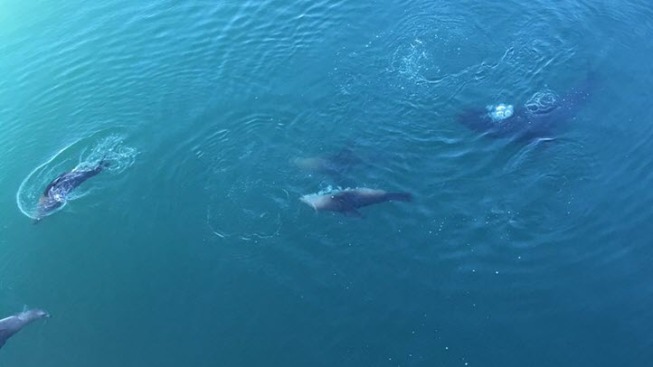 Wednesday's sightings come on the heels of another sighting off the Santa Cruz wharf late Saturday when a lifeguard and a swimmer spotted a white shark about 250 yards off Cowell Beach. Dozens of people were in the water at the time and lifeguards responded quickly to get them out safely. "Our life guard at Tower 1 said he saw the shark," Santa Cruz Fire Department Capt. Cody Muhly said. "And we called out and cleared the water." The sighting prompted firefighters to briefly post a warning sign at Cowell Beach, which was lifted Sunday. Many people visiting the area on Wednesday said they felt safe and were not concerned. "I'll keep a closer eye, but it's part of swimming in the ocean," Tamara Kleycontini said. "The sharks live there." Experts said shark sightings off the coast of Santa Cruz are not unusual. What is uncommon is spotting young sharks. Marine biologists believe they may be heading north because waters in the Bay Area are now warmer in the past due to El Nino. shark June 22 2016 from Specialized Aviation on Vimeo.